Axon degeneration is a characteristic event in many neurodegenerative diseases. Prof. Dr. Rugarli and her group are exploring the mechanisms underlying premature axon death. Her research focuses primarily on hereditary spastic paraplegia (HSP). The team of scientists has succeeded in identifying crucial pathogenic mechanisms that underlie the disease. The ultimate goal is to identify a common process responsible for axonal degeneration independent from the defective gene product. This could lead to the discovery of a central point of attack and a unified therapeutic approach for treating the many different types of HSP. Our research: Axon degeneration is a process that plays an important role in many neurodegenerative diseases. Premature axon death occurs preferentially in long neurons, such as the corticospinal tract that runs from the cerebral cortex into the spinal cord with axons up to one meter long. Under the leadership of Prof. Elena Rugarli, the CECAD working group is exploring hereditary spastic paraplegia (HSP), a group of rare genetic disorders causing the degeneration of axons of the corticospinal tract. Patients who suffer from HSP experience progressive spasticity and weakness in their lower limbs. In the later stages of the disease, patients may even be confined to a wheelchair. Our successes: The scientists in the Rugarli group have contributed to the understanding of the molecular and cell biological function of several HSP genes, thus elucidating pathogenic mechanism underlying axon degeneration in hereditary spastic paraplegia. The group was able to develop an in vivo model for one of the mitochondrial genes. It is currently being used to study both the gene’s function and the interaction of the gene product with other proteins. The ultimate goal is to achieve a deeper understanding of the processes in the mitochondria that lead to degeneration and how neurons might be protected in future. Our goals: The team of scientists led by Prof. Rugarli is currently working on understanding the function of several genes that contribute to the pathogenesis of HSP with the goal of dividing them into functional groups. Since loss of function of several genes cause the development of the same degenerative process, it is important to recognize commonalities and differences in the pathological pathways, in order to be able to devise effective therapeutic strategies and identify groups of patients that might respond to similar therapies. The researchers’ ultimate vision is to identify signal cascades in the axons involving a number of defective genes that would allow for interventions at the end of the cascade. This would make it possible to use the same treatment approach on as many patients as possible with a range of different genetic defects. The Rugarli group’s research is also dedicated to understanding how the viability of axons in healthy people is maintained over the course of many decades. Decoding this process is not just important for a better understanding of HSP. The results could also translate to other neurodegenerative diseases such as Parkinson’s or Alzheimer’s. With her team, Prof. Rugarli is improving our understanding of these age-associated diseases as well. 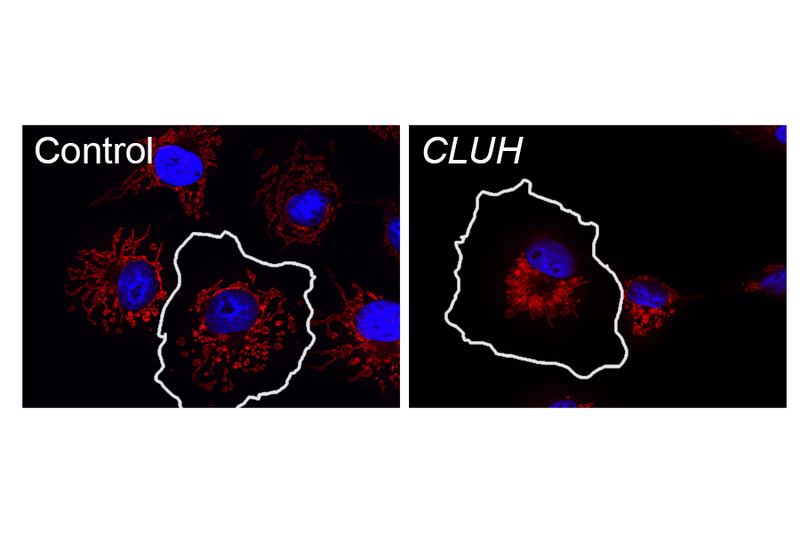 Figure 1: Downregulation of CLUH leads to clustering of mitochondria close to the nucleus. Cos7 cells were transfected with control siRNA or siRNA against CLUH. Mitochondria in control cells (left) form a tubular network all over the cell, whereas knock down cells (right) display a mitochondrial clustering on one side of the nucleus. Mitochondria are stained with Mitotracker Red (red) and DNA is stained with DAPI (blue). 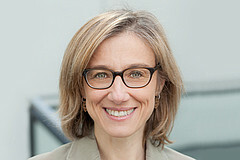 Prof. Dr. Elena Rugarli is Project Leader of the NEUROLIPID Consortium at E-rare (ERA-Net for Research Programmes on Rare Diseases), in which an additional German, an Italian and a French team are also involved.